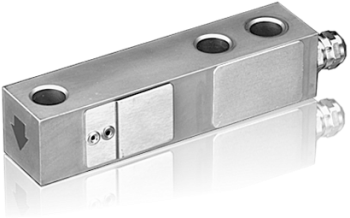 The shear beam load cell 3410 conforms to the classic weighing industry design and is available in capacities from 250 kg to 2000 kg. For more than 20 years, the design of this highly reliable alloy steel load cells has remained unchanged and currently millions are in use in a wide range of industrial applications. Typical applications include large platform scales, container, silo and belt weighing as well as force and torque measurements in the test and process industries. Approved to OIML R60 3000D and sealed to IP67, this load cell gives extremely accurate reproducible results, over a long term even in harsh industrial environments. For multi-cell application such as a platform, the current matched version of the 3410 (T end) removes the need for corner load adjustment using potentiometers. You can even replace a single load cell without the need for re-calibration. The 3410 shear beam load cell can be supplied with an optional ATEX II 1GD EEx ia IIC T6 certificate for use in hazardous gas and dust areas – Zone 0,1, 2 & Zone 20, 21, 22. Among the accessories specially developed for this load cell series include a range of feet, shock mounts and Cell-mates.